The innate cellular antiviral response is the first line of defense that all normal cells use to protect themselves against viral infections. While this is generally a good thing in the context of a pathogenic infection, for many therapeutics that are made using viruses, antiviral defenses can be a significant hurdle. For example, antiviral defenses in tumors lead to therapeutic failure when using oncolytic viruses. Similarly, antiviral defenses can lead to low productivity in cell-based viral vaccine manufacturing processes and lead to low transduction efficiency and transgene expression in gene therapy applications. By boldly screening tens of thousands of small molecules using high-throughput robotics, we have uncovered several novel compounds we call “viral sensitizers” or VSes (Diallo et al. Mol Ther, 2010). In some contexts, these molecules can increase the output of virus from cells by over 1000-fold. While the specific targets of many of these VSe drugs are unknown, evidence suggests that they effectively disable cellular antiviral defenses in different and unique ways. An important focus of our laboratory is to elucidate how each VSe drug elicits its effects at the molecular level in order to improve our knowledge of how they work and to better understand how cells defend against viral infections. To this end, we are using a variety of chemical, molecular biology, and high-throughput biology / computational approaches. We ultimately aim to use this knowledge to develop even better VSe compounds and engineer more effective oncolytic viruses. Many VSe compounds we have discovered as well as some viral sensitizing drugs that were discovered by other groups have the ability to enhance oncolytic virus activity in tumors but not in normal cells (Nguyen et al, PNAS, 2008; Diallo et al. Mol Ther, 2010; Alain et al. PNAS, 2010). This property makes it possible to use viral sensitizers to improve the activity of oncolytic viruses in animals and humans. As such, one pursuit of our laboratory is to delineate which viral sensitizers are most suitable for this application and whether some can be combined together for even greater activity. In addition, we also aim to better understand why these viral sensitizers improve oncolytic virus activity in a tumor selective fashion. To this end, we are using a variety of molecular biology techniques, mathematical modeling, and employing several animal tumor models. Projects involving viral sensitizers also include the synthesis and testing of sensitizer analogs with the goal of improving pharmacokinetic and pharmocodynamic properties, as well as research into the mechanism of action and biological targets of these compounds. Additionally, the identification of microtubule targeting agents in the high-throughput screen has launched a project examining the use of these agents with the goal of identifying strategies to minimize drug-associated toxicities. Naturally occurring tumours are highly heterogenous. Even within a given patient, different regions of the same tumour can exhibit significant differences in their molecular, genetic, and epigenetic profiles. This is thought to contribute to treatment resistance for a wide range of treatment modalities, including oncolytic viruses. We hypothesize that viral sensitizers “normalize” this heterogeneity by making tumors more homogeneously infectable. Nevertheless, better understanding the underlying causes of the heterogenous respnse to oncolytic viruses can bring forth new insight and also novel intervention strategies. 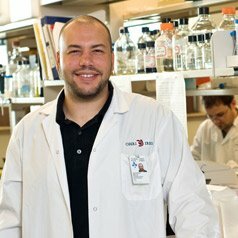 By isolating and comparing highly sensitive and highly resistant cells from tumours we aim to identify novel gene targets that correlate with resistance to oncolytici virotherapy that can be targeted to normalize the heterogenous landscape of tumours and make oncolytic virotherapy more effective in a broader range of patients. Viral sensitizer technology possesses the capacity to improve the production of viral therapeutics that includes not only oncolytic viruses, but also gene therapy vectors and viral vaccines. While global vaccine demands continue to rise with the ever-increasing world population, there is tremendous pressure on vaccine manufacturers and governments to provide sufficient quantities of vaccines for the population, particularly during pandemics. Among others, viral vaccine strains are often ill equipped to fight against the “foreign” antiviral defenses of these approved manufacturing cell lines. Because viral sensitizer compounds have been shown to increase viral production by > 1000-fold in some contexts, their application to viral therapeutic manufacturing is therefore a primary focus of our research team. With the help of academic and industrial partners, we are refining viral sensitizer formulations for use with particular viral therapeutic production technologies, aiming to robustly and safely increase their manufacturing capacity production using viral sensitizer technology. We thereby hope to improve global heath outcomes by increasing the efficiency of vaccine manufacturing and providing access to cheaper vaccines, particularly for developing nations. R Arulanandam, C Batenchuk, O Varette, C Zakaria, NE Forbes, C Davis, R Krishnan, V Garcia, R Karmacharya, J Cox, A Sinha, Andrew Babawy, K Waite, E Weinstein, T Falls, A Chen, J Hamill, N Da Silva, DP Conrad1, H Atkins, K Garson, C Ilkow, M Kaern, B Vanderhyden, N Sonenberg, T Alain, F Le Boeuf, JC Bell, JS Diallo, Microtubule Disruption Synergizes with Oncolytic Virotherapy by Inhibiting Interferon Translation and Potentiating Bystander Killing, Nat Commun. 2015 Mar 30;6:6410. F Le Boeuf*, C Batenchuk*, M Vähä-Koskela, S Breton, D Roy, C Lemay, J Cox, H Abdelbary, T Falls, G Waghray, H Atkins, D Stojd, JS Diallo, M Kaern*, JC Bell*. Model-based Rational Design of an Oncolytic Virus with Improved Therapeutic Potential. Nat Commun. 2013 Jun 14;4:1974. Diallo JS, Le Boeuf F, Lai F, Cox J, Vaha-Koskela M, Abdelbary H, MacTavish H, Waite K, Falls T, Wang J, Brown R, Blanchard JE, Brown ED, Kirn DH, Hiscott J, Atkins H, Lichty BD, Bell JC. A high-throughput pharmacoviral approach identifies novel oncolytic virus sensitizers. Mol Ther. 2010 Jun;18(6):1123-9. Our research team is interested in the study and development of novel "viral sensitizer" drugs that make cells more susceptible to viruses. Our goal is to use these drugs in diverse virus-based therapeutics, including for cancer and gene therapy, as well as to improve methods for producing vaccines.